HOUSTON–(BUSINESS WIRE)–SoftNAS® today announced the newest release of SoftNAS Cloud® that utilizes the wide spectrum of data stores available from the Microsoft Azure cloud platform ranging from high performance SSD-based to Azure Cool Blob storage. Azure customers using SoftNAS Cloud can now achieve both petabyte scale file storage and the best combination of cost, scale, data protection and high-availability (HA). Customers can move their large-scale workloads to Azure with confidence and free themselves of the expense and complexity of traditional on-premises network-attached storage (NAS) and storage area network (SAN) appliances. Azure provides customers the flexibility to tune capacity and performance as needs change. Customers desiring an operating expense (opex) model pay only for services used with the ability to scale to petabytes with SoftNAS Cloud. Using SoftNAS Cloud on Azure, customers preserve compatibility with file-based applications, freeing budget for use on other important digital modernization projects that offer high business value. Customers achieve greater security and control because SoftNAS Cloud allows easy HA with automatic failover and seamless data access. “Microsoft Azure provides massively scalable cloud storage. The availability of SoftNAS on Azure gives our mutual customers access to enterprise-grade cloud-based storage with more flexibility and choice, in a highly secure and compliant cloud,” said Venkat Gattamneni, director of product marketing, Microsoft Azure, Microsoft Corp.
SoftNAS Cloud customers can adjust storage performance, protection, and capacity at any time to suit changing workload demands, unlike physical storage hardware appliances whose compute and storage capacities take days or weeks to adjust. The newest release of SoftNAS Cloud leverages Azure Hot Blob and Azure Cool Blob storage to present NFS, CIFS/SMB with Active Directory integration, iSCSI and AFP targets. The new version also supports Azure General-purpose and Azure Premium Storage types. SoftNAS®, Inc. is the leading provider of software-defined NAS solutions and protects mission-critical data for customers using any combination of public, private and hybrid clouds. SoftNAS provides customers enterprise-class data protection, security, and performance required to safely, predictably, and reliably operate IT systems and applications. 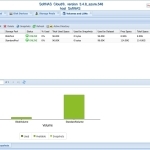 SoftNAS believes in powerful, hassle-free data management and works with any hardware, any data type, across any geography, and with any IT environment, including the most popular public, private, and hybrid cloud computing platforms: Amazon® AWS™, Microsoft® Azure™, CenturyLink Cloud® and VMware vSphere®.